Alessandra Kennedy wakes up to a veritable hell, locked in a cage and held captive by aliens. But her greatest fear is of what lies beyond those cell doors. What horrors will the new life beyond her prison have to offer? 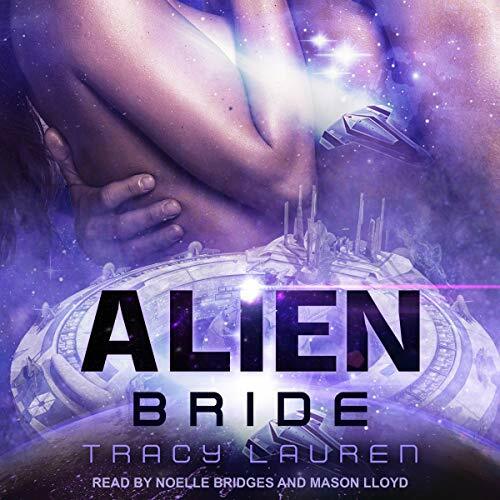 She imagined every worst-case scenario and all the horrible things that might await her, but never once did she imagine she would become an alien's bride. The strange new culture that takes her in certainly does things differently than humans. Will she be able to get through the time she shares with her alien husband (without arguing) for long enough to make it home? Or will she lose her heart somewhere along the way? Kye Amara, the rich and cocky diplomat, has always had everything at his disposal: money, women, success. But when a neighboring government tries to impress him with a gift of five beautiful slaves, he finds himself drawn to one of them. Quickly, this human tears down everything Kye thought he knew about himself, challenging him in a way he has never experienced before. Has Kye Amara finally met his match? And will he be able to prove he is man enough for his alien bride? It's really hard to like the story when you despise the main character(s). I found the heroine to be extremely annoying. Her stubbornness was just stupid and unnecessary. As for the story itself, it is slow with very little substance to hang on to. Not worth the credit or the anticipating for the release. I love the narrator of this book, however even with the amazing job I couldn't handle the grating main characters. They guy isn't as horrible as the main female. Quick to strike out, selfish, no ability to think of her surroundings, other worlds customs, and most of the time afraid. Always droning on about her on issues regardless of others around her. I absolutely couldn't finish this book mainly because of her. I thought it would be good because in the beginning it gives a more realistic view on a person's response to being abducted and sold into slavery and that's where my appreciation for this book ends. Listening to this story at parts where it was about the main female character was like nails on a chalk board. think really hard before you waste you money or credit on this book. I really loved these two books from this series but I’d love to have more from this author.